I have identifiedanother minor planet that is likely responsible for one of our meteor showers. Thecometary breakup that created the Kappa Cygnid meteor shower 4000 to 6000 yearsago has a fragment remaining: minor planet 2008 ED69! Meteorshowers, as they go, tend to become personal after a few unusual sightings.Especially when they contain exploding fireballs with multiple flares. No, I'mnot talking about the phenomenal Leonid showers, but about a delightful treatof summer nights: the KappaCygnids. I recall anice Kappa Cygnid fireball in 1993, the first summer after I had moved to California. I trained my binoculars at the position of the fading fireball, and saw theglow of a persistent train: a thin line that changed shape in the upperatmosphere winds like a twisting thread of silk on a damp day. That year sawmany Kappa Cygnid fireballs — so many, in fact, that they outshone a widelyreported outburst of Perseids. Observers at one site shouted so frequently thatlocal canines became excited, and the event became known as "the night of thehowling dogs." The KappaCygnids showed again in 2007. NASA and SETI Institute scientists videotapedseveral of these meteors during a test flight for an airborne observingcampaign to study the predicted return of the rareAurigid shower on September 1, 2007. 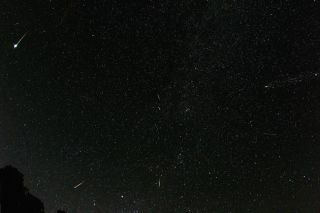 Among thefast moving Perseids were several slow moving meteors that radiated from apoint between the bright stars of Vega and Deneb. Some were as bright as thefirst quarter Moon and flashed in multiple colors. The crazything about this shower is its long duration, stretching through most ofAugust. Some showers endure because Earth travels through the meteoroid streamat a grazing angle, but not so for the Kappa Cygnids. This stream is inclinedat a steep 28-38 degrees. This also means that itsparent body is not easily confused with that of the thousands of asteroids thathave so far been discovered, most of which move in orbits close to the plane ofthe planets. So far, none matched the Kappa Cygnid orbit. We used tothink that the long duration of the shower was due to an advanced age with theparent long gone. Instead,the periodic showers of fireballs suggested to me a younger age. ?For yearsnow, I have been on the lookout for a remaining fragment of the parent bodythat created the Kappa Cygnid shower. I had found earlier that other well-knownshowers, such as the Quadrantids and Geminids, have such remaining fragments.No object was known for the Kappa Cygnids in 2006, when I published my book "MeteorShowers and their Parent Comets." In chapter 24, I write at lengthabout this stream, assuming it is one of many that were created in thedisruptive breakup of a mostly dormant comet in the recent past. The lack of areasonable candidate parent body, however, left this chapter unfinished, andthe Kappa Cygnid fragment became a very personal quest for me. On March11, 2008, at 11:54 UT, the Catalina Sky Survey detected an intrinsically brightH = +16.7 magnitude minor planet, now named 2008 ED69. The discovery wasquickly confirmed by the Mt. Lemmon Survey. It moved in an unusual orbit,passing close to the orbits of Jupiter and Venus in a 37-degree inclined orbit.Briefly, it was listed as a Potential Hazardous Object, but the latest orbitcalculations keep it relatively far from Earth's orbit. That is good for us,because the object would cause a big impact if it was to hit Earth. Assuming,as with other dormant comets, that only 4 percent of the sunlight striking 2008ED69 is reflected, it could measure 2.9 km in size. This is the same size asthat of minor planet 2003 EH1, the remaining fragment in theQuadrantid stream. As soon asthe discovery was announced, I calculated the theoretical radiant of the thenvery premature orbit and noticed that its meteors would radiate from Cygnus atthe time of the Kappa Cygnid shower. Over several days, more observations weremade and the orbit quickly became better known, much better than that of anyother Kappa Cygnid. I traced the orbital evolution of 2008 ED69 back in timeand found that it evolved with a large amplitude oscillation called a nutationcycle, lasting about 1800 years, in a manner typical for Kappa Cygnids. A paper wassubmitted to the Astronomical Journal on March 22. Review of the papertook a few weeks, during which the orbit of 2008 ED69 became better known.Jérémie Vaubaillon of Caltech calculated the orbital evolution of 2008 ED69farther back in time, and then projected forward in time the orbit ofmeteoroids ejected one, two, or three cycles ago. He found a good match betweenthe calculated distribution and the observed dispersion of dust all over Augustif the stream was created 2 or 3 cycles ago. The long duration of the showerresulted from the nutation cycle grazing the Earth?s orbit, some meteoroidsevolving slower than others. We determined that the stream is more massive thanthe remaining parent body, hence some form of fragmentation was implicated. Therevised version of the paper was accepted for publication on May 21. We concludethat the Kappa Cygnid stream was created in the breakup of a Jupiter-familycomet around 4000-1600 BC, 2-3 nutation cycles ago. The now mostly dormantminor planet 2008 ED69 is a remnant. Most of the debris passes close to theorbit of Venus, making the Kappa Cygnids a significant shower on Venus.Fortunately, the cloud of debris stretches far enough from the comet positionto make the Kappa Cygnids also a joy for Earth-bound observers, includingmyself, who will never look at this shower with the same eyes again. 2008 ED69is closest to Earth on June 22, and brightest in the first week of June whenits apparent visual magnitude +18.45 makes it a point of light in the constellationof Cassiopeia. I hope it will be studied in detail for signs of its cometaryorigin. For more information on its association with the Kappa Cygnid shower,see the article: "Minor planet 2008 ED69 and the Kappa Cygnid meteorshower" by P. Jenniskens and J. Vaubaillon, which will appear in TheAstronomical Journal later this year, when 2008 ED69 has moved on.